Take a look at the pictures below... Which victim suffered a vampire attack who knew what it was doing? If you guessed the middle, you are correct! 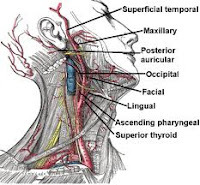 The large blood vessels in the human neck (carotid artery and jugular vein) are oriented vertically, so an experienced vampire who knows the anatomy and desires a good feast of blood would want to bite in the same direction. The other bites were probably committed by vampires with a total lack of experience.